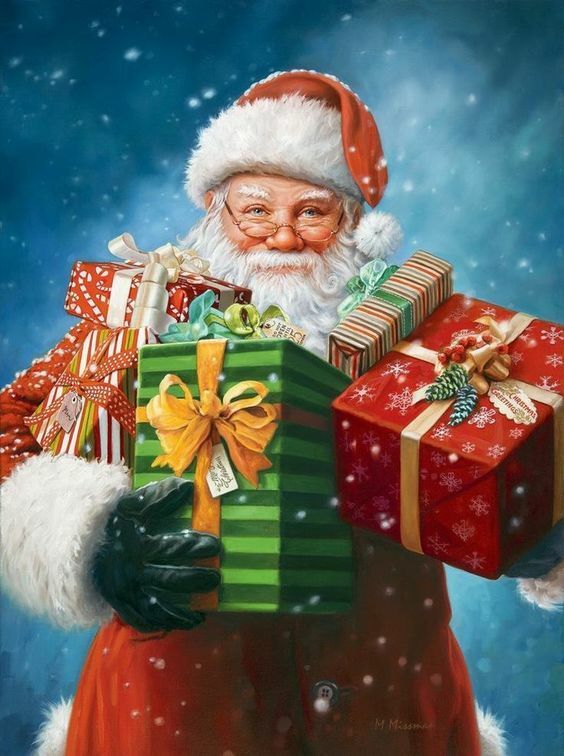 Santa Claus, also known as Saint Nicholas, Kris Kringle, Father Christmas, or simply Santa, is a lengendary figure originating in in Western Christian culture who is said to bring gifts to the homes of well-behaved ("good" or "nice") children on Christmas Eve (24 December) and the early morning hours of Christmas Day (25 December). 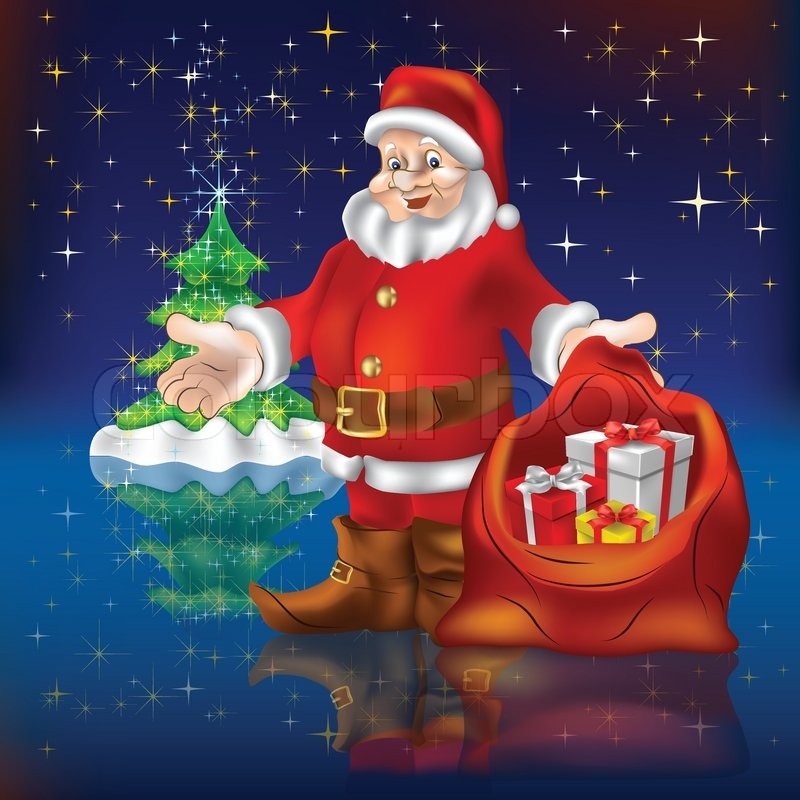 Santa Claus is generally depicted as a portly, jolly, white-bearded man – sometimes with spectacles – wearing a red coat with white fur collar and cuffs, white-fur-cuffed red trousers, a red hat with white fur and black leather belt and boots and who carries a bag full of gifts for children. 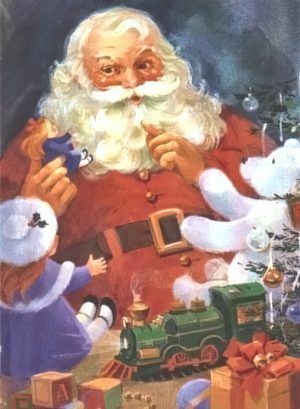 Santa Claus is said to make lists of children throughout the world, categorizing them according to their behavior ("good" and "bad", or "naughty" and "nice") and to deliver presents, including toys, and candy to all of the well-behaved children in the world, and coal to all the misbehaved children, on the single night of Christmas Eve. 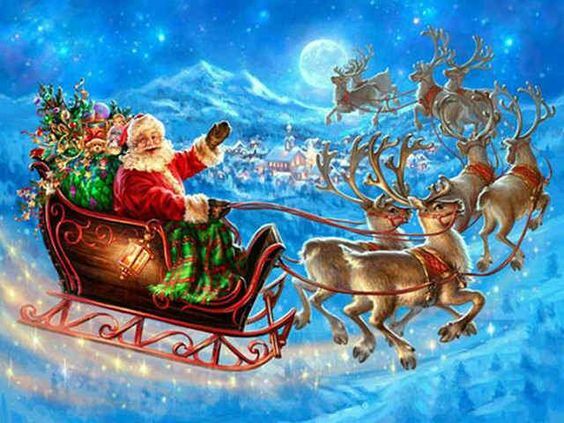 He accomplishes this feat with the aid of his elves, who make the toys in his workshop at the North Pole, and his flying reindeer, who pull his sleigh. 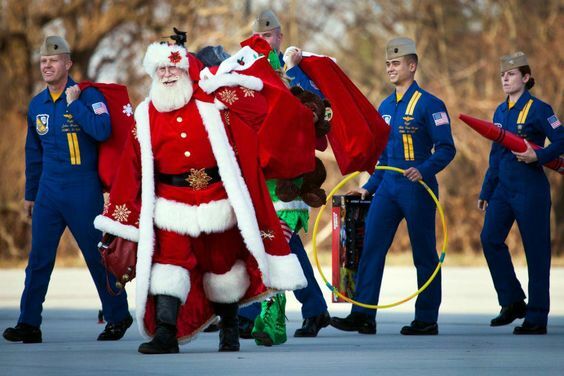 He is commonly portrayed as living at the North Pole, and often laughing in a way that sounds like "ho ho ho". 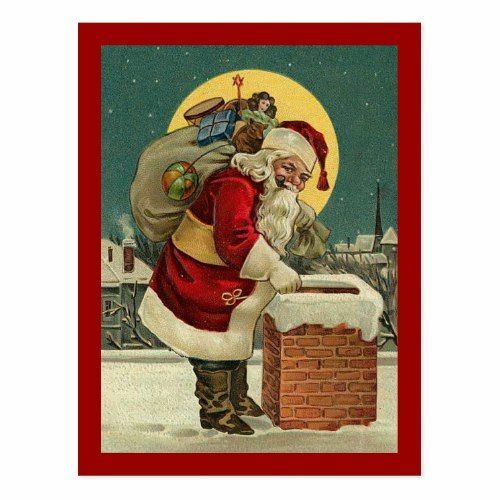 The tradition of Santa Claus entering dwellings through the chimney is shared by many European seasonal gift-givers. 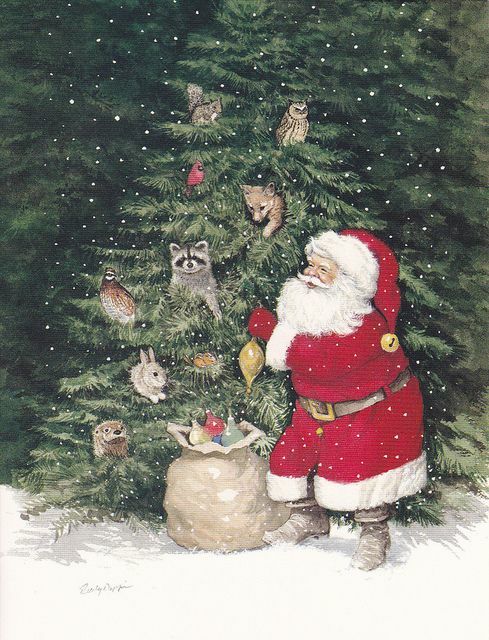 In pre-Christian Norse tradition, Odin would often enter through chimneys and fire holes on the solstice. 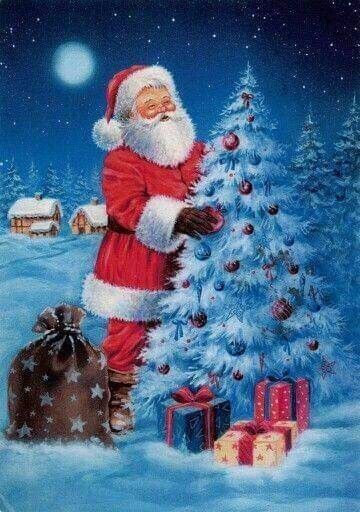 In the Italian Befana tradition, the gift-giving witch is perpetually covered with soot from her trips down the chimneys of children's homes. 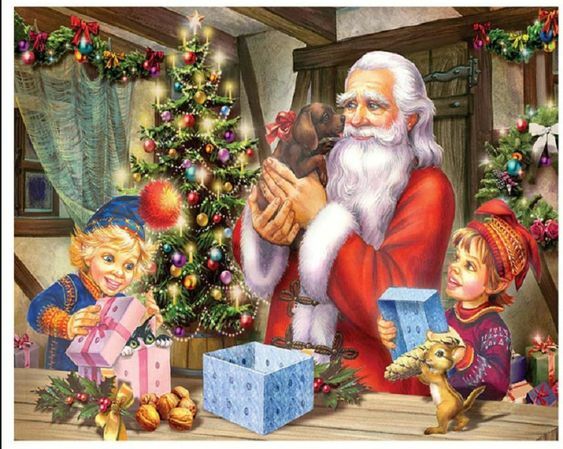 In the tale of Saint Nicholas, the saint tossed coins through a window, and, in a later version of the tale, down a chimney when he finds the window locked. 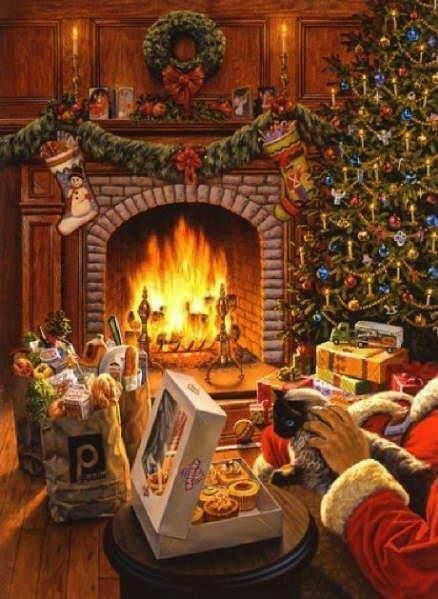 In Dutch artist Jan Steen's painting, The Feast of Saint Nicholas, adults and toddlers are glancing up a chimney with amazement on their faces while other children play with their toys. 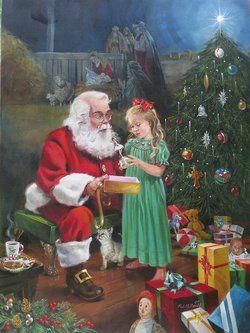 The hearth was held sacred in primitive belief as a source of beneficence, and popular belief had elves and fairies bringing gifts to the house through this portal. 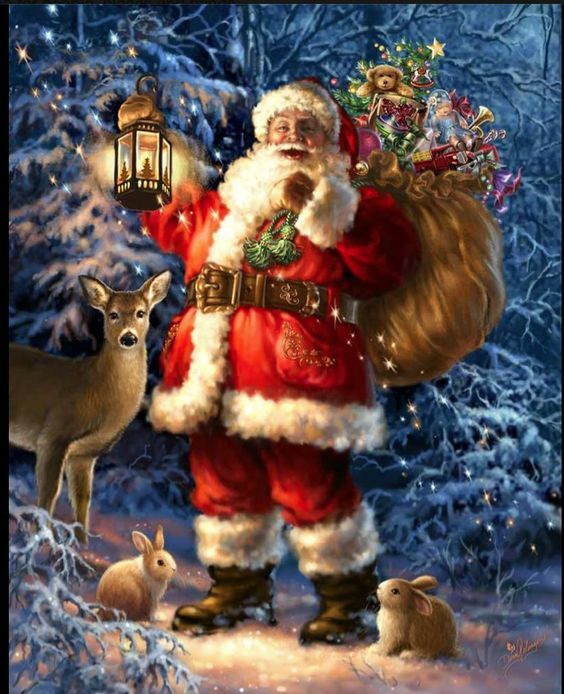 Santa's entrance into homes on Christmas Eve via the chimney was made part of American tradition through the poem "A Visit from St. Nicholas" where the author described him as an elf. 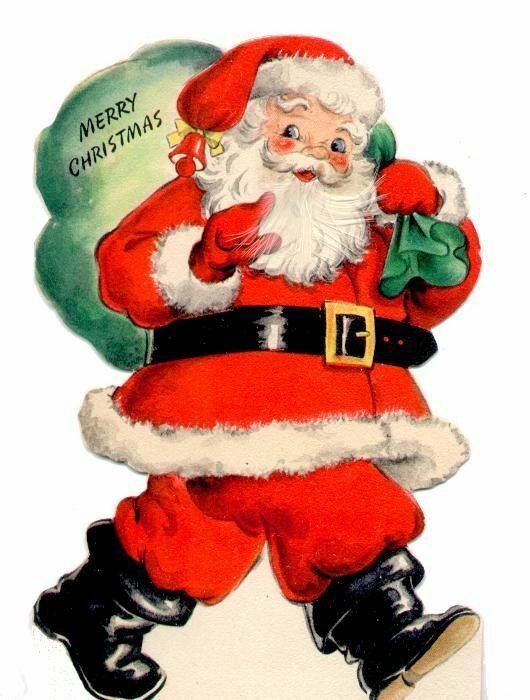 In the United States and Canada, children traditionally leave Santa a glass of milk and a plate of cookies; in Britain and Australia, he is sometimes given sherry or beer, and mince pies instead. In Denmark, Norway and Sweden, it is common for children to leave him rice porridge with cinnamon sugar instead. 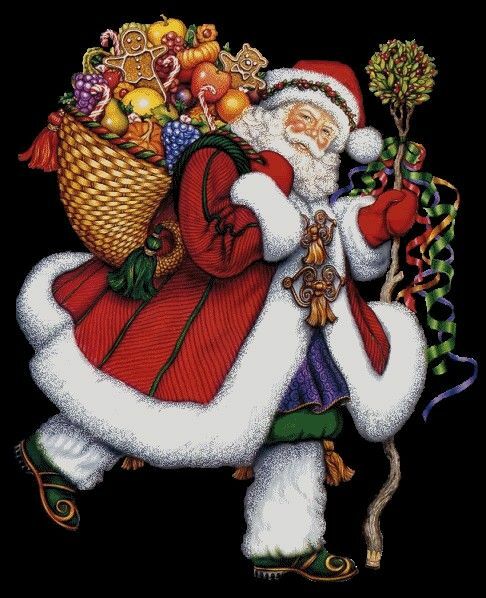 In Ireland it is popular to give him Guinness or milk, along with Christmas pudding or mince pies. 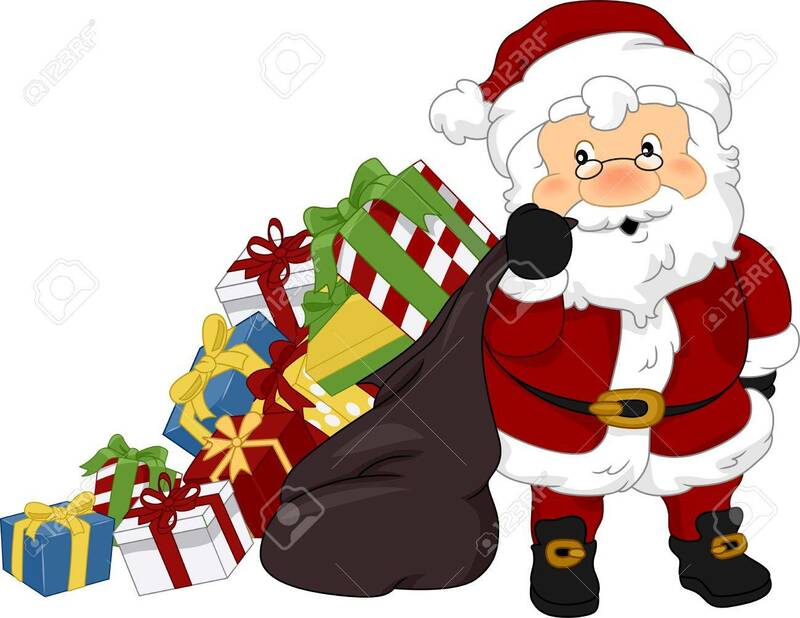 New Zealander, British, Australian, Irish, Canadian, and American children also leave a carrot for Santa's reindeer, and are told that if they are not good all year round that they will receive a lump of coal in their stockings, although the actual practice of giving coal is now considered archaic. 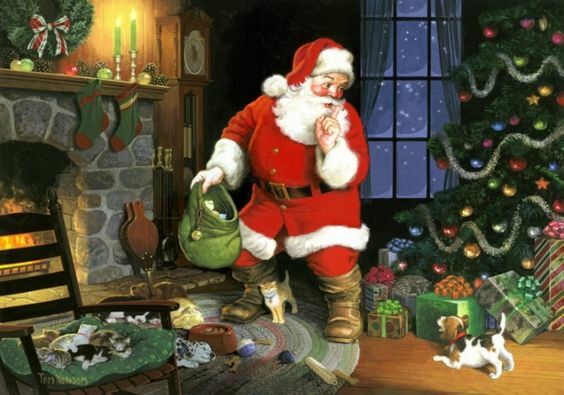 Children following the Dutch custom for sinterklaas will "put out their shoe" (leave hay and a carrot for his horse in a shoe before going to bed, sometimes weeks before the sinterklaas avond). 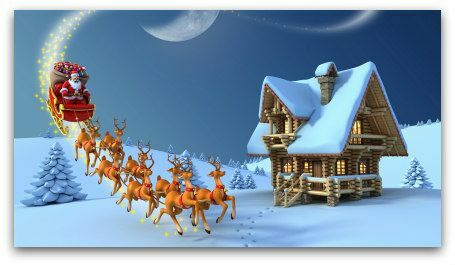 Other Christmas Eve Santa Claus rituals in the United States include reading A Visit from St. Nicholas or other tale about Santa Claus, watching a Santa or Christmas-related animated program on television (such as the aforementioned Santa Claus Is Comin' to Town and similar specials, such as Rudolph the Red-Nosed Reindeer, among many others), and the singing of Santa Claus songs such as "Santa Claus Is Coming to Town", "Here Comes Santa Claus", and "Up on the House Top". 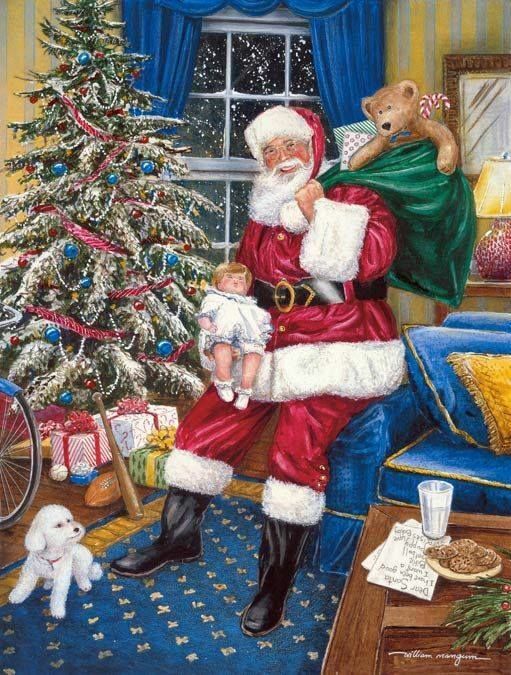 Last minute rituals for children before going to bed include aligning stockings at the mantelpiece or other place where Santa cannot fail to see them, peeking up the chimney (in homes with a fireplace), glancing out a window and scanning the heavens for Santa's sleigh, and (in homes without a fireplace) unlocking an exterior door so Santa can easily enter the house. 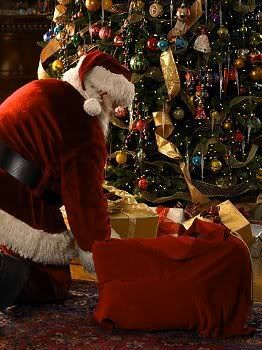 Tags on gifts for children are sometimes signed by their parents "From Santa Claus" before the gifts are laid beneath the tree. 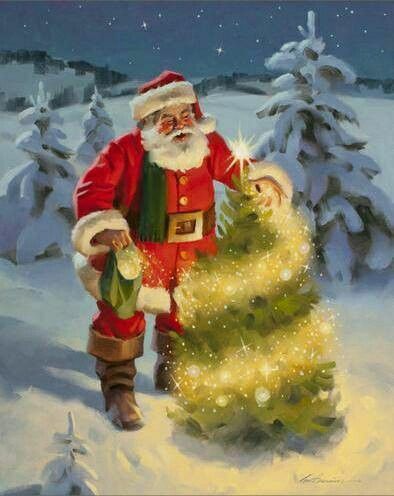 Santa Claus's home traditionally includes a residence and a workshop where he creates – often with the aid of elves or other supernatural beings – the gifts he delivers to good children at Christmas. 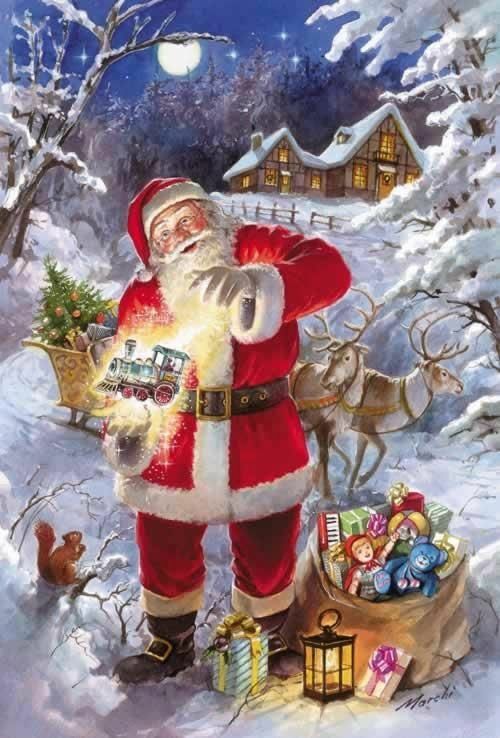 Some stories and legends include a village, inhabited by his helpers, surrounding his home and shop. Writing letters to Santa Claus has been a Christmas tradition for children for many years. These letters normally contain a wishlist of toys and assertions of good behavior. Some social scientists have found that boys and girls write different types of letters. 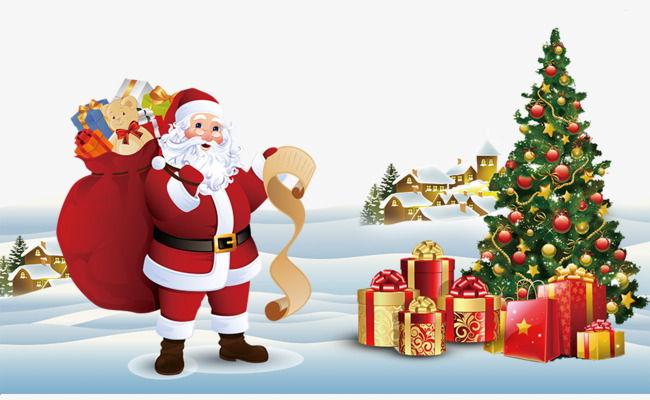 Girls generally write longer but more polite lists and express the nature of Christmas more in their letters than in letters written by boys. Girls also more often request gifts for other people. 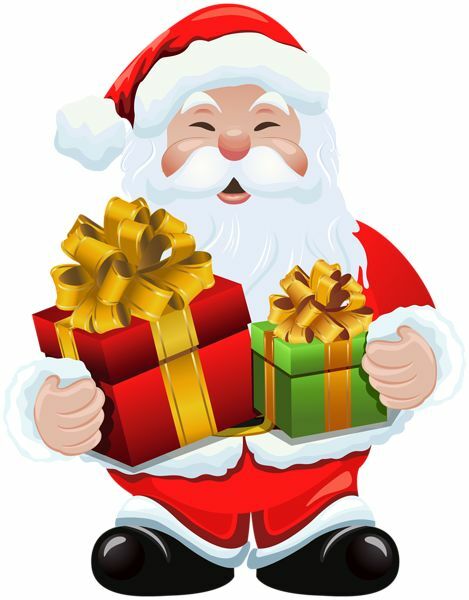 Many postal services allow children to send letters to Santa Claus. These letters may be answered by postal workers or outside volunteers. 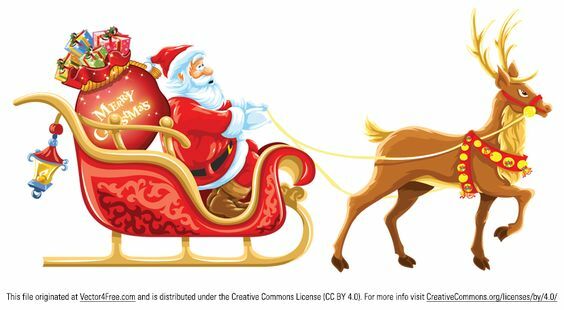 Writing letters to Santa Claus has the educational benefits of promoting literacy, computer literacy, and e-mail literacy. 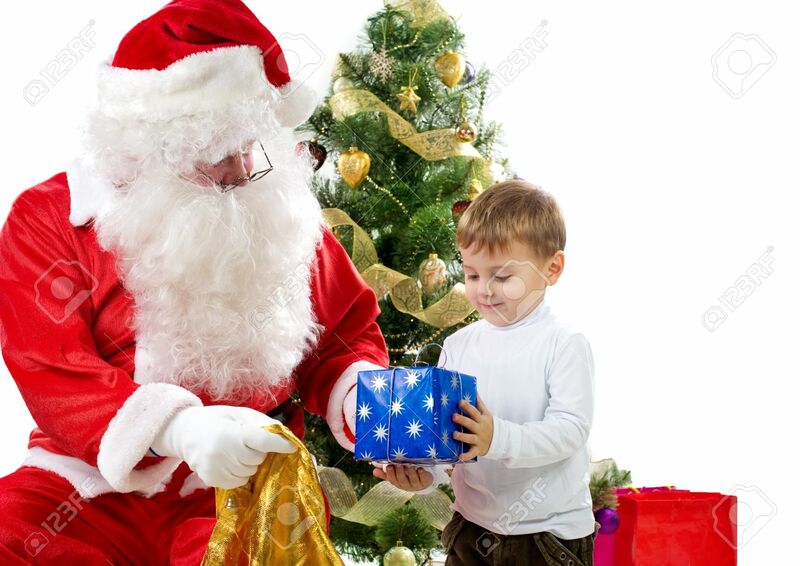 A letter to Santa is often a child's first experience of correspondence. Written and sent with the help of a parent or teacher, children learn about the structure of a letter, salutations, and the use of an address and postcode.